Researchers at the University of Georgia analyzed the nutritional content of eight fruits and vegetables (sweet corn, broccoli, cauliflower, peas, green beans, spinach, strawberries, and blueberries), and compared fresh and frozen versions. The study showed no significant nutrient content in the majority of their comparisons, specifically in vitamin C, vitamin A, and folate content (a water-soluble vitamin B). 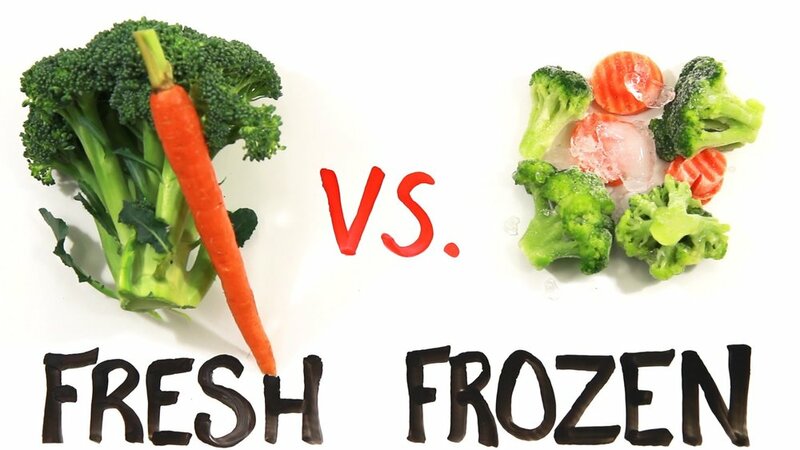 Where there were differences, the frozen produce was shown to actually retain more of its nutrients than fresh produce. The reason for this is explained in how produce starts to decay after it is harvested. Fruits and vegetables start to release heat, lose water, and produce enzymes that cause them to spoil. This degrades their nutrient content over time. So, if you are buying fresh, you want to eat them as soon as possible. This also makes a strong case for purchasing local produce if buying fresh. Freezing produce, on the other hand, stops the decaying process and preserves the nutrient content. One thing that does impact nutrient content, regardless of whether you buy fresh or frozen, is how you cook your vegetables. Some vegetables with water-soluble vitamins lose some of their nutritional value if steamed or blanched. Go for fresh if you are having bell peppers, citrus fruits, cabbage, or berries. Vegetables such as carrots, leafy greens, and broccoli have fat-soluble vitamins and are good choices for choosing in frozen or fresh form if you are steaming or boiling. Boiling or steaming some veggies like carrots or broccoli may actually boost their nutrient content as antioxidants and phytochemicals are released during these cooking methods. If you want to be on the safe side and not have to look up what type of soluble nutrients are in your veggies, get either fresh or frozen, whichever works best for you, just take it easy on the temperature and cooking time, and use little or no water. That method will preserve the nutrients and work for the vast majority of vegetables you need to cook. Aside from what is mentioned above, there is one big additional thing to consider. How soon are you going to eat it? We’ve all had good intentions of making a nice dinner when we get home and then work or traffic screw up that plan, or friends hit you up at the last minute to go out to eat. Too often the result is that fresh produce gets tossed. The National Resources Defense Council reports that the average American household throws out $2,200 in food each year. How can you keep from contributing to that statistic and save your money? Make a shopping list and avoid impulse buying at the grocery store. Make meal plans for the week or month and buy only what you need. Be creative with produce that’s on its way out. Are your bananas turning brown? Make them into bread or a smoothie. Or, use mostly frozen vegetables supplemented from time to time with a few fresh ones. I’ve had success with that method and tend to only buy fresh veggies for salads for the next couple days as I need them, and frozen everything else. Take a second to compare prices of fresh versus frozen. If you’re buying out of season or a vegetable that is not available locally, likely frozen is going to save you money. You might also save time, as in the case of cauliflower, corn, or broccoli, that have significant prep times in their fresh variants. Whichever you chose, rest assured that you really can’t go wrong whether you choose fresh or frozen, so get your servings in.